Dr. Rodney Jackson, Director of the Snow Leopard Conservancy, is widely considered the leading world expert on the snow leopard, having devoted over 30 years to researching and conserving this elusive cat in South and Central Asia. His 1980’s pioneering radio-tracking study of snow leopards in the Nepalese Himalaya led to a cover story in National Geographic. Jackson received the 1981 Rolex Award for Enterprise. He has trained biologists across many of the snow leopard’s 12 range countries, although his real passion rests with helping local people co-exist with this elusive predator. 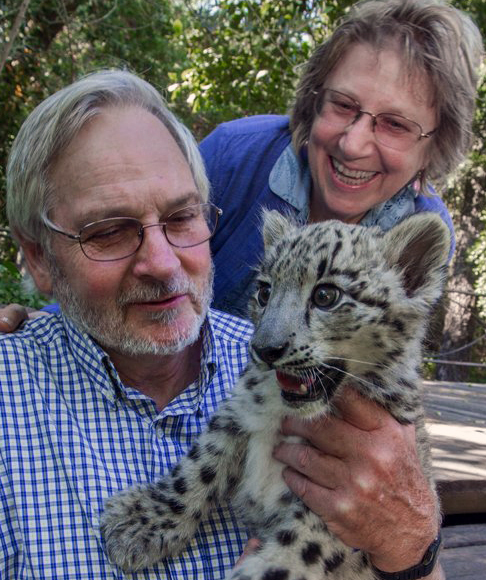 He and Darla Hillard’s work with rural communities led to the establishment of the Snow Leopard Conservancy in 2000, and the development of grass-roots interventions, including predator-proofed corrals, Himalayan Homestays and a suite of other economic incentives for transforming the snow leopard from a pest to a valuable asset in the eyes of local people. Advancing community-based stewardship of the snow leopard through education, research and grassroots conservation action. Our goal is to transform snow leopards from being perceived as pests by herders into assets valued more alive than dead. We create innovative, highly participatory, self-governing community-based conservation programs that serve as models for others, while simultaneously building in-country capacity of individuals and organizations for snow leopard conservation, research and education. The Conservancy currently works in seven of the twelve range countries: Bhutan, India, Kazakhstan, Mongolia, Nepal, Pakistan, and Russia.